Installation and configuration of Kushki payment module in Prestashop. Plugin source code can be download here: https://github.com/Kushki/kushki-prestashop/releases. Kushki payment module downloaded in zip file format. Prestashop store installed and configured with USD and COP currencies. Access to the administration section of Prestashop online store. In order to install the module it is necessary to enter the administration section of our prestashop store, once you have logged in, go to the section: Personalizar > Módulos. 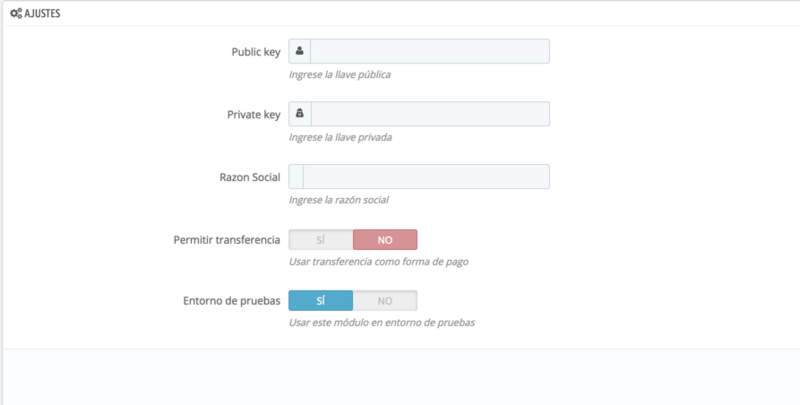 On the module screen, click on the button Subir un módulo. A new modal is displayed in which we can drag our downloaded module in zip format or we can use the file manager to find our module. If the installation has been successful we can configure the module to start testing it in our store. We can configure the module in two different ways. After installing the module in the confirmation screen gives us the option to configure. 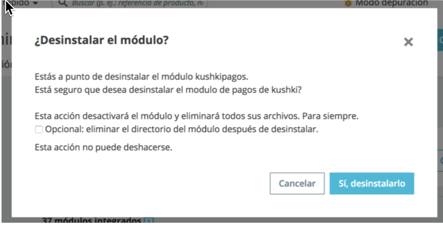 In the module administration screen, we select the tab of installed modules will show us a list of all the modules installed in the store once our Kushki module has been identified, we select the button Configurar. Public Key and Private Key: Public and private key provided by Kushki. Test environment: Value to define if you are in production or test environment. 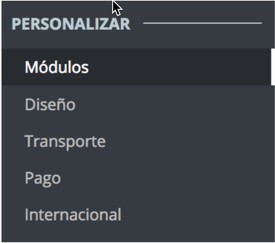 Allow transfer: Valid only for Colombia, we define if we are going to allow payments with Transfer. Entity: It is the name by which collectively the company is known, and it is used to generate the details in PSE. Note: In case of not having entered the public or private key, the option of payments in the store can not be displayed. Additionally, in the notifications tab in the administration section of the modules, you will see a warning if you do not have public or private keys configured. To complete the uninstallation we must confirm that we want to uninstall the module and if we want we can also choose the option to remove the module directory.